Get ready to MOON JOURNAL + MOON COLLAGE your heart out - it's almost SAGITTARIUS Term of my Lunar Inspired Divine Feminine eClass at Wise Woman University! My Divine Feminine eClass is now Self Study! Dearest Divine Moon Musers - My Awaken Your Divine Feminine Soul eClass is now a self study program available for $19.95 which also includes a personalized Moon Chart. I suggest starting at the New Moon and working your way through each week's lessons and assignments in tune with Mama Moon. You will also receive a personalized Moon Chart so that you can tie in your personal Moon sign with the moon sign of the month. For example, my moon is in Aquarius in the 11th House (the Aquarian House) so I might want to take the eClass in January when the New Moon is in Aquarius or in August when the Full Moon is in Aquarius. I originally offered my eClass at Susun Weed's Wise Woman University in 2010 and it quickly became the most popular and well attended class of the year; what an amazing experience! We "Moon Musers" are still good friends, mainly through Facebook but eventually we'll meet up in person, I just know it. I was drawn to this course to unearth my spirituality and integrate it into my daily life. I tend to allow myself to get caught up in a madcap pace and feel like I'm running away from real life. By putting forth effort to be connected with the moon phases, to regularly write and collage, to align myself with like-minded women, and shake up the "norm" within, is long overdue! Your eCourse is falling right along the lines of what I need right now ... self-discovery involving creative juices and perhaps even some spiritual development. Thank you Kathy! I have a lot of things to process - and I think this course has been the first real shake-up of my inner spiritual eye! Did I suddenly realize (like everything in my life) that it is always up to me to make the choice of healing? Yep. It doesn't mean that I have to embrace things that I have left behind for many reasons. It doesn't mean that I have to change into a woman that I don't like. It doesn't mean that being solitary is bad and I have to stop. It only means that I can move closer to what I have asked for many years ago, when I was young (13). I don't care if I am beautiful, I just want to be wise and to share that with others. Kathy is indeed a shining light, illuminating the way for you to find what you are seeking through creativity, art, moon musing, astrology, mid life transition …the list is long! As a mentor she has the knack of, despite being in the northern hemisphere in Southern California, making you feel as if you are sitting next to her having a good ol’ chat! She emanates a warmth that feels like a beckoning hand outstretched as she gently guides you to find your path. Most importantly though – Kathy makes it FUN! Divine Moon Muser, Michelle Buckley, Creative Soul. Working on my collages with the moon and sharing in the chat room with the other moon sisters has helped me open up more on a personal level. It’s really allowed me to target a change in my life and it has also helped me understand what I want to create for my future. 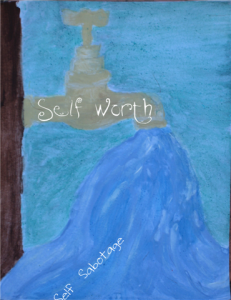 One of the biggest goals that I accomplished during this course was to be happier with myself and more confident in all areas of my life. I learned that if I trust in myself great things will happen. I don’t consider myself to be a creative person (art, drawing, etc. ), so I was very proud that I didn’t just create one collage, but five. I can't thank you enough for having this course and for the wonderfully open and supportive atmosphere you've created, it has been totally transformative for me and has given me so much direction, I just can't believe it. I don't want to leave...PLEASE!!!!!! don't say it's over!!! 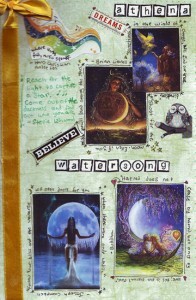 Moon Collages from my February eClass: Awaken Your Divine Feminine Soul. Aquarius New Moon Collage by Michelle B. Full Moon in Leo Collage by the Divine Michelle B.
Crone Moon in Pisces Collage by the Divine Michelle B. Here's my own collage created for the New Moon in Capricorn, Full Moon in Cancer and the Waning Moon in Scorpio. The background is taken from one of my newest paintings which is part of my Journey Into Intimacy Series. I incorporated three of my Lefty Oracle Cards which I had chosen for each of the moon phases (Skell, Sharmin' and Guess). The Yin Yang symbol in the upper right and the Black Mermaid (from my Laguna Beach Mermaid Series) in the lower right represent the balancing act I'm doing between life/art/work which is also represented by the half goat, half fish symbolizing the zodiac sign of Capricorn. The circle of copper ribbon that I've sewed onto the collage represents the dedication and focus that is required to develop my Creative Soul Circle. For my new moon collage I chose pictures that showed how I wanted to be empowered by the moon, along with quotes and song lyrics that I felt expressed the inspiration I was looking to find in the next month. In my full moon collage I expressed the seeds of intention I had planted through words and pictures. I included a picture of the cycle of the moon to show how I had changed throughout the month. I also added pictures of my power animals, and the names of the two goddesses that have guided me this month along with their strengths that I wish to find in myself. Awaken Your Divine Feminine Soul: Register here for the next eClass.